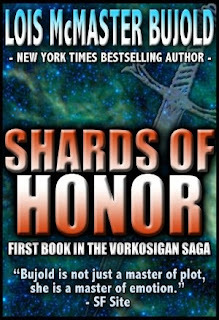 I'll admit, when I got the Humble ebook Bundle I didn't have any idea of what I was getting into with Shards of Honor. I'd vaguely heard of the Vorkosigan Saga and generally they seemed good things, but I'd never really looked into the series enough to get a solid idea of what it was all about. I figured from the blurb that it would be military science-fiction of some sort, but not much beyond that. More or less completely blind going in. Nice. 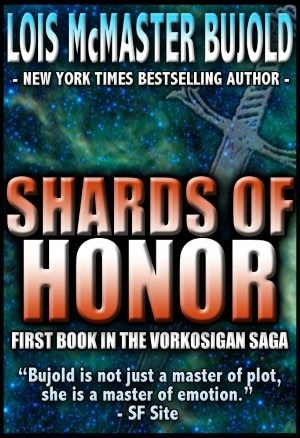 Shards of Honor follows Cordelia Naismith, the captain of a scientific survey crew who becomes the prisoner of Aral Vorkosigan, a man of sinister reputation and the former commander of the soldiers who attacked her crew. But despite the initial mistrust, the two find themselves growing unexpectedly attracted to one another, and must face the possibility of being forever parted when their planets threaten to go to war. I honestly didn't think I was going to like Shards of Honor when I first started reading it, as the narrative kind of throws the reader in at the deep end. I hadn't gotten further than maybe the first couple of pages in and it's throwing around new terms for planets and space-age weaponry with gay abandon. More than a little off-putting at first, not unlike trying to get your head around Nadsat in A Clockwork Orange for the first time. But like the aforementioned Nadsat, your head does manage to wrap itself around the more unusual terms with surprisingly little extra information. Having adjusted myself to being thrust into the plot with a lot more speed than I am accustomed to, I realised that despite my initial reservations I was really enjoying myself. While the easiest way to describe the novel is military science-fiction with romance, Shards of Honor takes those base elements and does some really interesting things with them. So, first the military bit. I'm actually kind of surprised at how little fighting is actually shown directly. Possibly this is due to the main character being more or less a non-combatant, but the parts of war that are shown most often can be boiled down to internal politics and large scale battle strategy. Considering how much I love some politics and back-stabbing, I was totally in my element. Additionally, it was good to see that the sides aren't easily delineated into purely good or malign. While the invading Barrayaran army is mostly in the wrong, it has a mix of Caligula types versus more noble types like Vorkosigan. Similarly, while there are perfectly reasonable people on the side of Escobar and Beta Colony like Cordelia, there are a surprising amount of people unwilling to look beyond basic propaganda messages. And no-one gets out of war unscathed, even or perhaps especially those who got what they wanted from the conflict. I am definitely looking forward to reading more about this world. Second, the romance. I was pleasantly surprised that the novel focused on a middle age romance. While I'm a sucker for most kinds of romance, I don't think I've really seen much in the genre where the people involved aren't in their mid-twenties or younger (aside from the supernatural stuff, but even then no-one thinks or looks over thirty). It was refreshing to see the romance unfold with more maturity and a more thoughtful pace. It's established pretty quickly that both Cordelia and Aral have been badly burned by their romantic attachments in the past, so their connection is less outwardly passionate, but no less powerful for it.